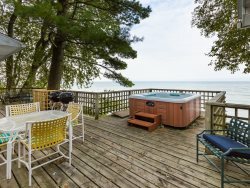 Located at 87 Bluff Dr in South Haven, with this vacation home, getting to the sandy beach is not a problem. This cedar sided vacation home is an absolute perfect retreat for a relaxing week at the beach. Beautiful views of a wooded ravine from the deck or cathedral ceiling windows. Access to a beautiful semi-private sandy beach is across the street and three doors down. Drive or bike to downtown in a few short minutes for dining & shopping. Perfect!!! Please Note: Water levels and beach conditions change on a regular basis. Some days there is not much beach and some days there is quite a bit of beach.. However, everyday you can enjoy the beautiful views from this house. The Shores staff was extremely helpful and patient with my many questions. We had our stay scheduled for May when all three of our sons had the time available from work and school calendars, with one in Detroit, and the other two in Iowa and East Lansing respectively, time was very tough to coordinate. This was a location that was easy for everyone to get to, it also allowed for pets, at which time our dog was getting old so we did not want to board her. But the week of our stay we had a death to a mother and had to change our plans at the last hour. This was past the contractual cancelation time, but when we explained our situation Shore Vacation Homes, nicely and surprisingly told us that we could reschedule later in the summer. They did not have to but showed that they too had hearts and wanted to take care of us. We greatly appreciated that gesture. Only two of our three sons were able to attend the later rescheduled date, but we shared with him through Skype and snap chat the beautiful area, view and house. This property was wonderful, the pictures and description's online did not define how nice this home really was. You come to expect the upfront information to be beyond the reality and what you actually find is less then the pictures, not here. Our overall experience working the Shores Vacation Rentals has been wonderful. They are so helpful and pleasant and respond immediately to any questions or needs that we had. Love the Guest House. It offers everything anyone could want in a "home away from home." All the people involved in our stay have been fantastic. Makes us feel almost like family. We are so glad we found The Guest House. Mostly via email now and always satisfied. Seven years in a row and hope to be back for many more. It was our second time and it was a great experience again! The owner was so friendly and helpful. Love bringing our dog too! One of the best vacations we have had. Beautiful home, friendly owners, fantastic setting. Beautiful property, great location, clean. Shores employees have always been so helpful and kind. It was a beautiful getaway. Gorgeous place, the owner is so nice and helpful, couldn't have been a more perfect weekend!!! We were completely satisfied with out stay in the cottage. We love staying at The Guest House. This was our third year staying there, and we enjoyed every minute of it. Friendly and responsive. You need to update your welcome email for this property...it has the OLD wireless network info. Tim and Darlene (the owners) are wonderful...they really want their guests to get the most out of the experience. Not intrusive in any way, but it's nice to know they are there. The location of the property on a quiet cul de sac within 20 yards of the stairs to the beach is perfect. Lovely place to stay, would come again. Overall a very nice place. Great views and most amenities were great.